Information security and cloud are the most sought-after skills that empower organizations to flawlessly function and accelerate business performance if utilized appropriately. Both information security and cloud professionals are highly demanded by the organizations worldwide as there is no business that could survive for long in absence of expertise in any of these areas. New Delhi, India, November 13, 2018 --(PR.com)-- InfoSec Train is a pioneered IT and security training company that has proven its expertise in producing highly skilled information security professionals and cloud practitioners. To contribute more to their training solutions and enable aspiring and existing professionals in security and cloud computing domain, InfoSec Train is hosting two commendable workshops coming days. On December 1, 2018 an all-round free workshop on “Getting Familiar with Azure & AWS” to render deep insights of the most widely used AWS and Microsoft Azure cloud is being hosted by InfoSec Train. This workshop includes a six hours interactive session that will be hosted by Microsoft certified professionals having several years of industry experience with AWS and MS Azure. The webinar will focus to imbibe far-reaching understanding of both AWS and Azure clouds, virtual machines (VMs) and networks, websites deployment in the cloud, cloud services, cloud storage, Amazon S3 and Amazon Glacier Storage, Amazon Elastic Compute Cloud (Amazon EC2), Amazon EBS, Amazon Virtual Private Cloud (Amazon VPC), AWS database service, and IAM (Identity and Access Management) in the AWS. An all-inclusive free workshop on “Information Security & Penetration Testing Essentials” will be conducted by the industry’s certified experts from 15th to 16th December, 2018. The workshop will constitute two separate detailed complementary and interactive webinars hosted by leading security practitioners and will comprehensively explain core concepts of information security and penetration testing. 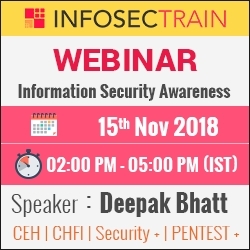 The Information Security Awareness & Pen Testing Webinar to be conducted on 15th November, 2018 will walk you through various aspects of security such as securing the cloud, operating systems, network connections and mobile devices. The pen testing (hands-on) webinar will instil lab-intensive understanding of hacking fundamentals and related areas including types of hackers, ethical hacking, Kali Linux, application and network based attacks and cryptography. This holistic workshop will also demonstrate hands-on implementation of various tools, technologies and best practices to enforce utmost security to various IT components and resources cost-effectively.